Do you remember MySpace? It used to be “the” social media outlet several years ago and then Facebook moved into the forefront. I discovered quite a few very talented and interesting artists thanks to that site. Kama Linden was one of those artists that I ran across; a beautiful woman with a powerful, yet angelic voice and an infectious personality and attitude. The more I looked into the artist, the more intrigued I became with her. Her 2008 album Better Late Than Never helped to prove that she was no one trick pony; she is an artist of many layers. Well, Kama is back and is solidifying her versatility in the world of music by going country on her new release Southern Comfort. Now, before you scratch your head and start to wonder why on the world did she go that route, step back for a moment and think about her previous releases. There were country and folky elements apparent throughout Better Late Than never as well as her 2006 album Uninhibited, so is this really that big of a stretch? Southern Comfort combines all the elements that make Kama great at what she does: catchy songs and infectious melodies, plus her sassy attitude is all over the album. It’s not what one would consider old school country, but more modern country that has that pop feel to it. I think the opening track “Make Room For Mama” sets the tone for what can be expected on the album. This one is a toe tapper and it is sassy and I love that Kama’s personality seems to shine on this one. For the most part, the album is very upbeat and so infectious that you can’t help but to tap your toes. There are several standout tracks on here including the title track, which may be somewhat autobiographical with lyrics such as “trade in my Yankee cap for a cowboy hat” and “I want to get back to my music roots”. The track “Jersey Girl” is another track that may be somewhat autobiographical in its content as well. Kama wrote all of the songs on the album, so that fact wouldn’t surprise me at all. Her vocal delivery on these songs, as well as the entire album, is sweet to the ear and so comforting. It’s hard not to fall in love with a voice like that. Now, I do have to admit that I really like when Kama applies the brakes and slows the tempo down to do a slower, mellow type of song. She definitely delivers this time around with “That Way” as well as “Do What You Gotta Do”. I love the up tempo toe tappers, but there is just something really special about her songs when she changes up like that; her voice is smooth like butter. Overall, I think this is probably the most solid album that she has delivered to date. Kama seems focused and determined this time around more than ever. She assembled a top notch group of musicians to help record this album and the deliver in a major way. It does have that country twang to it and the fiddle and steel guitar are great instruments to help provide such a flavor. The album definitely packs more substance to it than a good part of what’s on Top 40 radio right now. 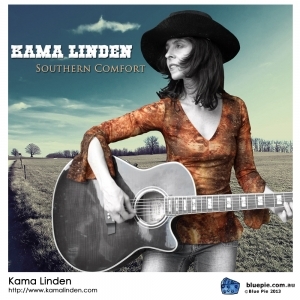 Do yourself a favor, you need to give this Kama Linden a listen and Southern Comfort would be a great introduction to the world of this super talented artist. Thank you so much for a beautiful review, John!